LOS ANGELES, Calif. /California Newswire/ — The magical time of year between Thanksgiving Day and New Year's Day is filled with thoughts of family celebrations, colorful decorations, gift-giving, gatherings of friends, and the fun of kissing under the mistletoe. "All of those wonderful things are in this song," states country music artist Sandra Piller, singer of "Mistletoe and You," now available on iTunes, Amazon, and the website of her record label, Shady Hill Records. "It was a joy to write this song and have Sandra record it," notes Jane Bach, co-writer of the song with David Scheibner. Bach also produced the recording at sessions in Nashville. "We thought about all the lovely moments that everyone enjoys about the season, from the big issues like peace on earth to the simple pleasure of sipping eggnog around the fireplace." With a glance upwards to a sprig of green leaves and red berries pinned above the doorway, she added "And, of course, we thought about kissing your love under the mistletoe." The video for "Mistletoe and You" features the lyrics of the song superimposed over the traditional yule log burning brightly in the fireplace. "It is such fun to work with Jane," notes Piller. "Not only is she a terrific writer but she knows just how to guide artists as a producer when we're all in the studio." As a veteran music professional in Nashville, Bach penned number one hits by Reba McIntire and Ray Price, as well as hit songs for many other country artists. Shady Hill Records ( http://www.shadyhillrecords.com/ ) was founded several years ago to record, distribute, and foster the cause of contemporary country artists whose work respects and reflects the strong traditions of the roots of American music. Video to "Mistletoe and You" – http://youtu.be/CfZjX53yHXg . For more information about Sandra Piller, Jane Bach, Shady Hill Records, and "Mistletoe and You," or to schedule an interview with Sandra Piller and Jane Bach, please visit the label website, http://sandrapiller.com/ or contact G-Man Marketing (PH: 818-223-8486). 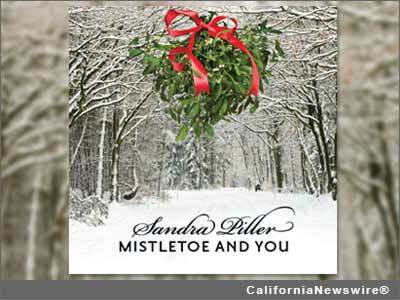 Sandra Piller "Mistletoe and You"